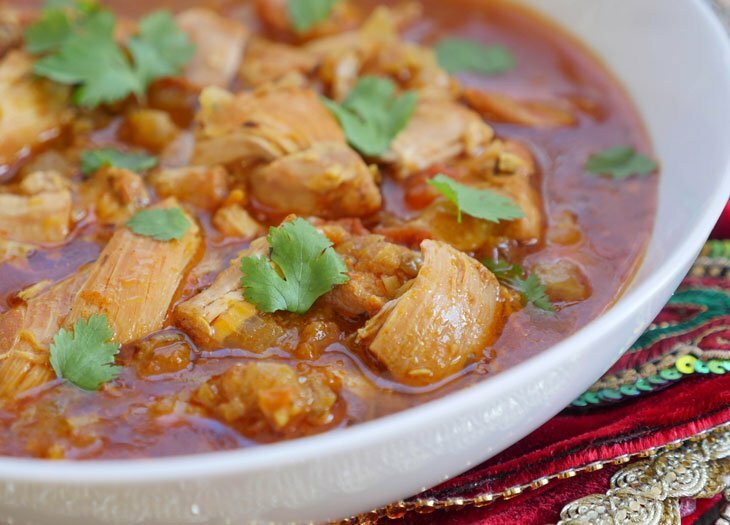 This Indian chicken curry is so flavorful and comforting. This is the chicken curry of my childhood. It’s the curry that my mom made weekly and while I didn’t appreciate it as much back then, now it reminds me so much of home. You know that scene in the movie Ratatouille when the food critic eats ratatouille, a dish from his childhood (this is the scene if you don’t know what I’m talking about)… Well, THAT is how I feel when I eat this chicken curry. I realize you probably don’t have any emotional attachment to this dish – at least, not yet. But give it a try. This is a simple chicken curry – no cream, no frills. Just a bunch of humble Indian ingredients found in any Indian pantry. 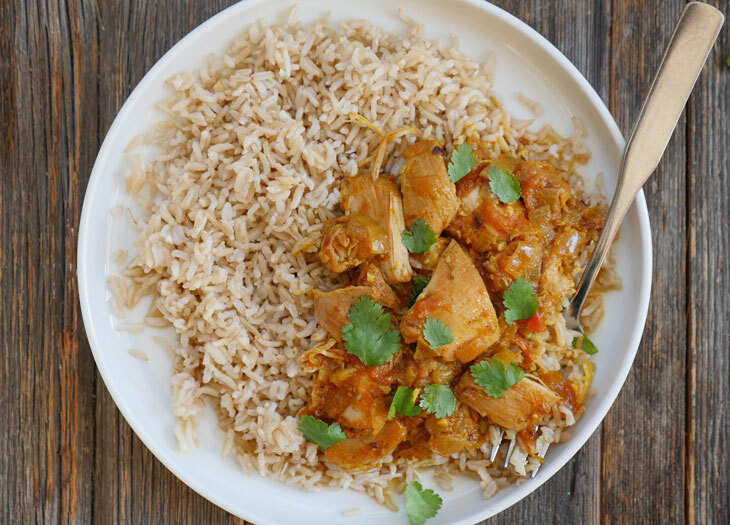 And now this chicken curry is even easier to make – thanks to the Instant Pot + my pre-made onion masala! I feel like I went from being super sentimental to sounding like a commercial lol 😂. But I mean, I have to sell you guys on my onion masala because it makes Indian cooking SO easy. This recipe is part of my onion masala series called: Onion Masala LOVE. I’m sharing recipes using this masala all throughout the month of February! 💘 My goal: to show you how easy it is to prepare Indian food on a daily basis. 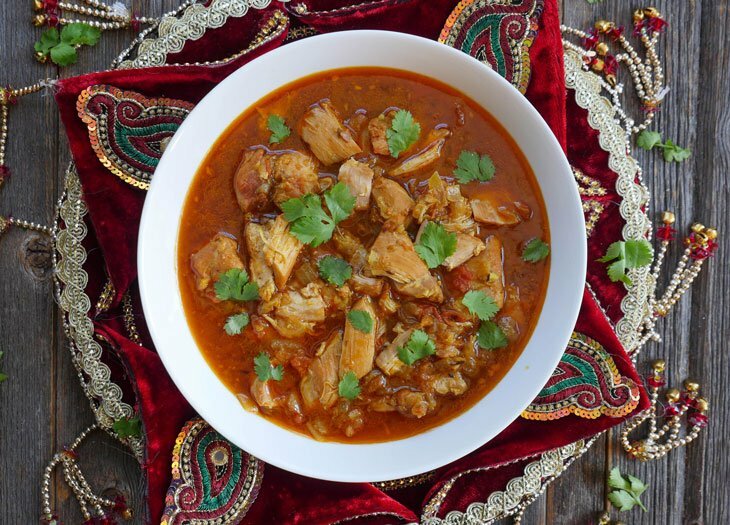 About 5 years ago, I shared a similar stovetop version of this chicken curry on the blog. It’s about time that I shared an Instant Pot version with you. I hope you make this and love it! 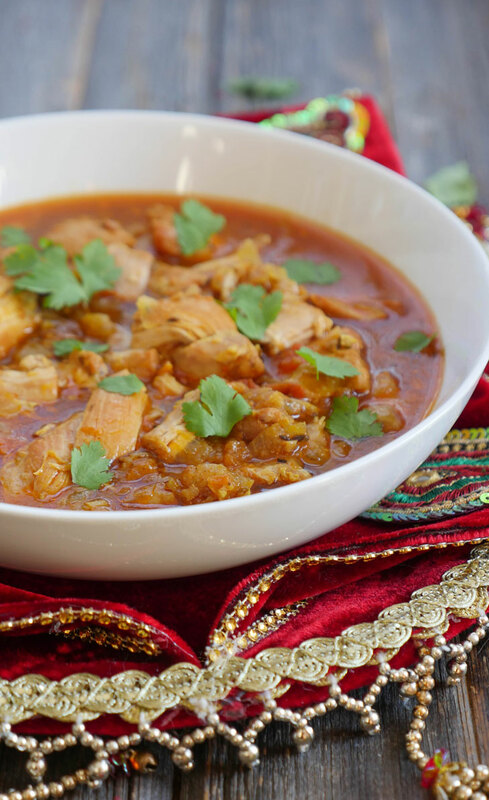 Serve this Instant Pot Indian chicken curry with chapati/roti – or if you are gluten-free then serve it with my paleo naan. You can also serve it with basmati rice or brown basmati rice! Press the sauté button, add the oil and allow it to heat up for a minute. Add the cumin seeds and once they brown, add the chicken and spices, mix well, then add the onion masala and water. With the onion masala made ahead of time, this was a crazy simple recipe. Delicious too! I served it over cauliflower rice mixed with a “super greens” mix. I will be making this again without a doubt. Thanks Ashley! Any chance of there being a listing for this without the prepared onion masala? 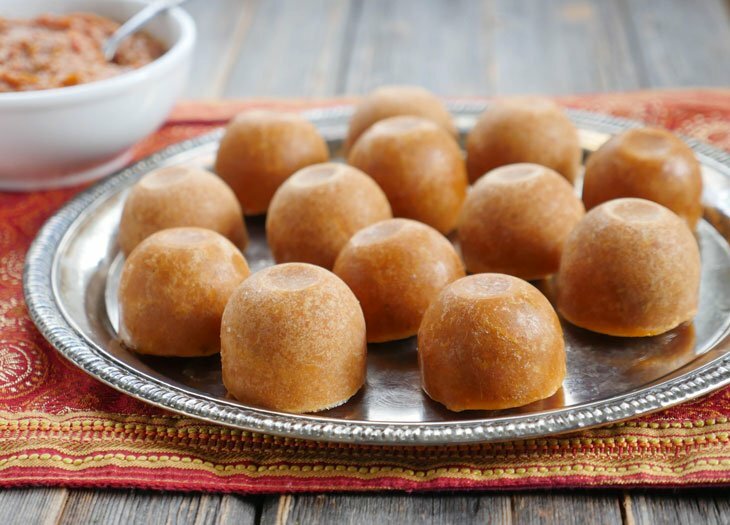 Freezer space is a real premium in my kitchen right now so I would prefer to make this (and a few of the other Onion Masala Month recipes) from the original ingredients. 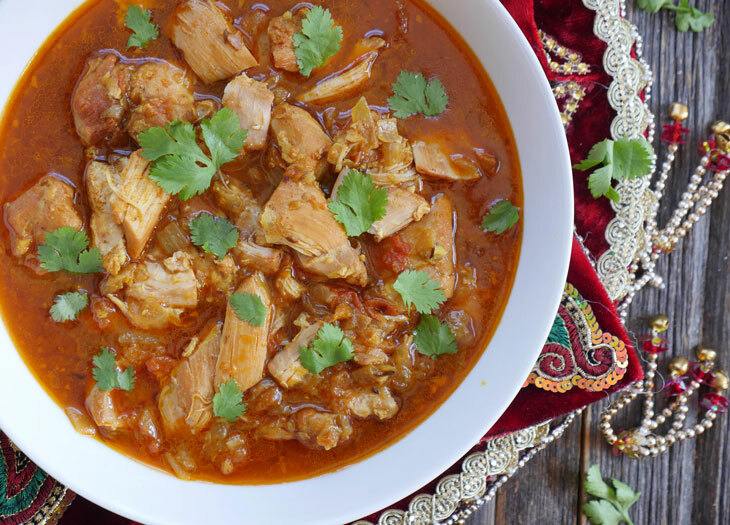 Hi Nathan, you can find my stovetop recipe here with the full list of ingredients – you’ll want to cook the onions and tomatoes before pressure cooking: https://myheartbeets.com/chicken-curry/ As for the onion masala, you can leave it in the fridge for a few weeks if you have room there (I do understand about freezer space, my little freezer is always packed to the brim). This recipe is perfect! It’s quick, inexpensive, & delicious. I have no complaints. This looks so delicious! I’m wondering if there is a way to sub ground cumin if I don’t have the seeds? Thank you! Cumin seeds really do add a nice flavor, especially when browned but if ground cumin is all you have then you can use it – just add it in with the other spices. It’ll still be delicious 🙂 Let me know how it goes, Josephine! If don’t have the onion masala, what porportions of onion/tomato can be used in its place? Thanks! My whole family loved this! I’ll make a double patch next time. So glad you liked it, Michelle! 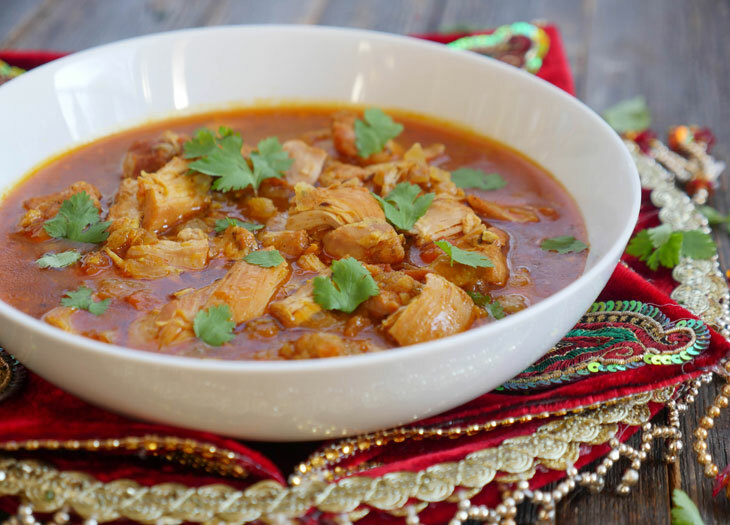 I’ve always found Indian food–or anything with more than 5 ingredients, really–but by breaking this down into “onion masala” and “chicken curry,” I felt empowered and made a delicious meal. Thank you very much for the simplification and the new onion masala addiction. 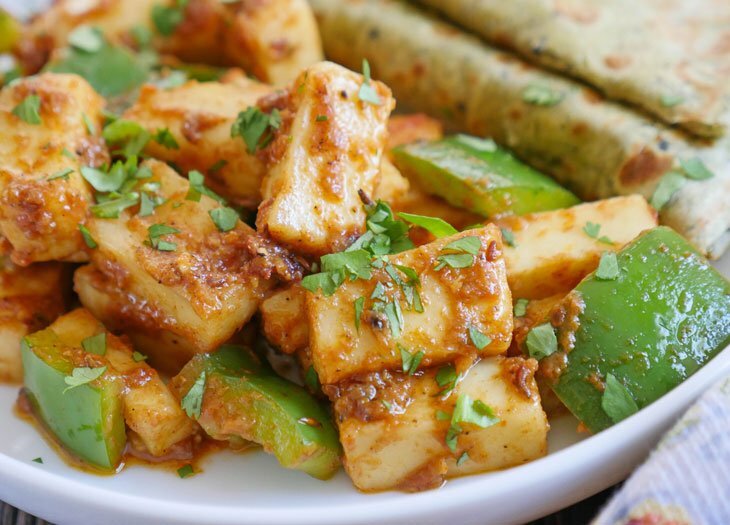 Another great recipe made even easier with the Indian Onion Masala. I added some lightly roasted cauliflower at the end to make it a one dish meal. It was a big hit. Thanks Ashley! Really must thank you for saving our dinner today! My husband was supposed to bring fish home which I was going to prepare simply. But he left work late and couldn’t make it to the store on time. So I had about ten minutes to figure out dinner while my husband gave the baby a bath. I used some lamb roast I had, cut in cubes, then followed your chicken recipe above except cooking for a longer time – 10 minutes. Next time I might even do 12. Went up to feed the baby, then came down and whipped up a quick raita / heated up rotis. It was DELICIOUS! Can’t believe it came together so quickly. Your onion masala is genius! Anu, I’m so happy to hear that you liked this curry so much! It’s great to know that the lamb worked in place of the chicken – thank you for letting me know 🙂 Also, I have to say – you sound like a super mom! I made a batch of the onion masala last weekend and made this chicken curry during the week. It is delicious and was so quick and easy to make!!! Both my boys loved it and my 5th grader happily took the leftovers for lunch the next day. This is going in our regular rotation! Thank you so much for another terrific recipe! It may have been the extended Sunday funday talking but this recipe was ridiculously tasty. My guests also said the same, so it wasnt just me. We also made some instant pot basmati rice and it also came out much better than our rice cooker (using your instructions). The two items we’ve cooked thus far were tasty, excited to try out more! How would I change your recipe to use chicken breast? Ashley, it looks like you used boneless chicken? With bone in, how long would you suggest for the cook time? Palu, if you are using small pieces of bone-in chicken or drumsticks then I’d adjust the time to 10 minutes NPR and that should do it! 🙂 Let me know what you think of the curry! How many servings does this yield? And is it straightforward to double the recipe? Preeti, I’d say it’ll serve 4-5 and as for doubling it – double all the ingredients but keep the cook time the same. The pot will just take a bit longer to reach pressure. Enjoy! Hi. How many onions, tomatoes and ginger garlic paste should I use if I don’t have pre made onion masala? Thanks! Hi, when a recipe calls for paprika, should I use sweet, hot or smoked? Hi Robert, if a recipe (especially one of mine) calls for paprika then use plain/sweet paprika. If one of my recipes calls for hot or smoked paprika then I will always specify in the ingredients list. I hope that helps! It’s crazy how good this is and it was so easy to make with the pre-made onion masala. Another keeper! Laura, that’s so great to hear 🙂 Thank you for letting me know how it turned out for you! Hi Ashley! Thanks for this easy recipe! I tripled all the ingredients, the flavor was there but I thought the sauce was a little runny. Any advice on thickening it a little bit? So I used 4.5 lb chicken, 2.5 cup onion masala (fresh) and only 1/2 cup water. But it was too runny. Hi Ashley, do I need to brown the chicken in this recipe? I think in the chicken bhuna recipe it calls for browning, just wanted to check for this recipe since I’m new to cooking. Hi Sharmila! I actually don’t brown the chicken for this recipe – it’s more of a dump and cook recipe since the onion masala is already cooked 🙂 I do quickly stir the chicken so it’s coated with the spices but that’s it! Let me know what you think! Made the onion masala a few days ago and made this recipe last night. I doubled the recipe but not the cooking time. Added the cilantro and mine looked exactly like the pic here! Very tasty BUT for some reason I forgot to add the paprika even though it was right there. Grrr… Anyway, it needed a little salt, as a result of skipping the paprika I think, I added a teeny bit of soy sauce to my serving and it was perfect. Can’t wait to try your other Onion Masala recipes and I plan on keeping this staple in the freezer for now on. Made making this recipe so easy. Thanks! So easy and delicious! 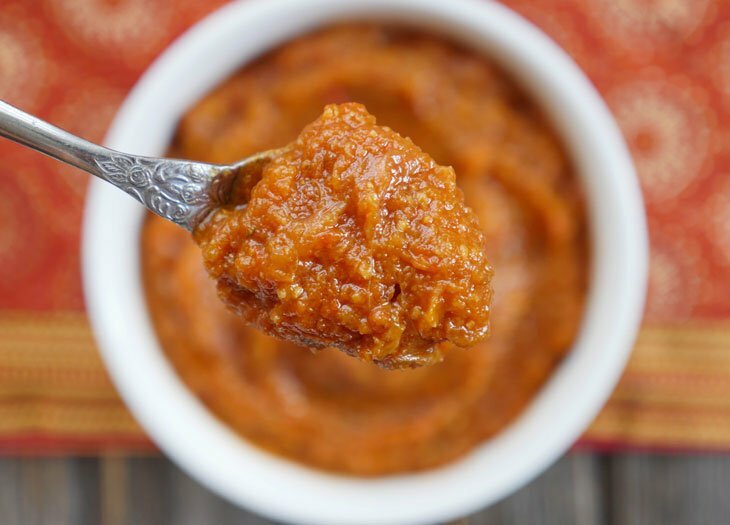 Thanks for sharing the brilliance of onion-tomato masala and making life so much simpler. It took a bit of extra water to avoid the dreaded burn error, but wasn’t an issue after that. Rachel, that’s so great to hear! I’m so glad you like the onion masala and this curry 🙂 Also, chicken curry tacos sound amazing! I’m going to have to try that some time – thanks for sharing! Super quick with the onion masala premade. That frozen masala has saved me SO much time, thank you thank you thank you!! I’m so happy to hear that! Thanks for letting me know how much you like the onion masala!! My kids won’t eat chicken thighs for some reason. Do you know how to adjust the time for chicken breasts? Quick question – I have the 8 quart IP, would your recipe stay the same for me or do l have to adjust the time? Hi Mandy, all of the IP recipes on my site are tested using a 6 quart instant pot but I’ve heard from others who have successfully used my recipes with an 8 quart. You may need to add a bit more water in some recipes though due to the larger surface area. I made the Onion Masala this past weekend (my mom was so proud 🙂 ) . I am planning on making the chicken curry tonight. Quick question. Do I need to cook the chicken a little before adding to the instant pot or 5 minutes of high pressure should be enough? I apologize if my questions sounds dumb, I am new to cooking chicken (and cooking in general) and want to make sure I do not mess it up! Thank you again for your hard work and sharing your amazing receipes! PS: I used some of the onion masala with my scrambled eggs and loved it!! I’ve made this a few times and the flavour is delicious, but the texture seems a bit off when I’m using frozen meat rather than fresh! Any tips? Erika, just to clarify – are you thawing the meat before pressure cooking? If not, I would suggest doing that. Let me know!